Abstract: The project OPTIMA will advance the capacity of CMEMS to accurately assess the state of the marine environment, by developing the first system that assimilates ocean-colour absorption data of plankton functional types (PFTs) into an ecosystem model endued with a new bio-optical module. OPTIMA goes beyond state-of-the-art operational models, which assimilate ocean-colour data of total chlorophyll, and which are currently challenged by simulating reliably the underwater light fields, the phytoplankton groups and their optical and biogeochemical feedbacks. 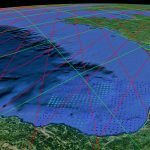 The new assimilation system will be an upgrade to the operational model in use at the CMEMS North West Shelf (NWS) Monitoring and Forecasting Centre (MFC). Firstly, a new algorithm will produce time series of spectral absorption of PFTs from ocean colour in the NWS; secondly, a spectral bio-optical module will be implemented in the CMEMS NWS MFC; thirdly, the CMEMS NWS MFC model will be upgraded to assimilate optical data of PFT absorption; finally, the new system will be applied to produce a reanalysis of optical and biogeochemical indicators in the NWS. Ultimately, by enhancing CMEMS capability to monitor and simulate optical and biogeochemical indicators, this project will help end-users to achieve their requirements and help marine policy to safeguard ocean ecosystems.